Alloys often are added to steel to increase desired properties. Marine grade stainless steel, called type 316, is resistant to certain types of interactions. There is a variety of different types of 316 stainless steels, including 316 L, F, N, H, and several others. Each is slightly different, and each is used for different purposes. 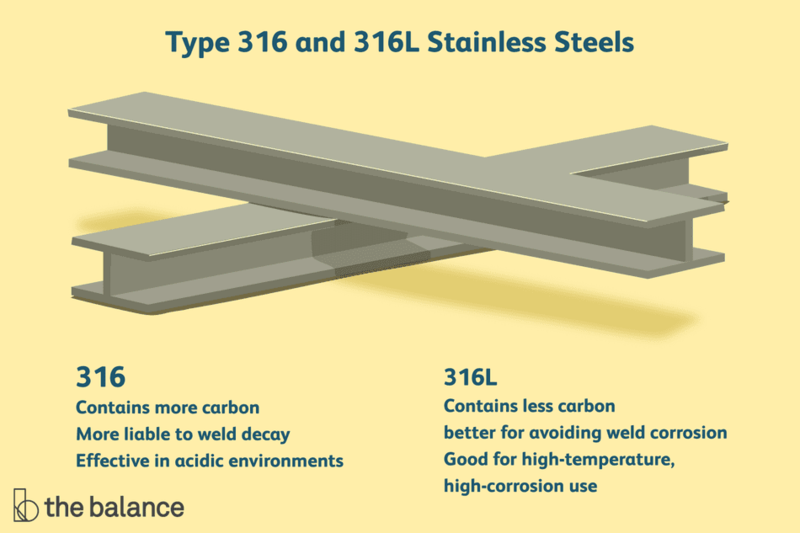 The "L" designation means 316L steel has less carbon than 316 steel. While similar to Type 304, which is common in the food industry, both type 316 and 316L exhibit better corrosion resistance and are stronger at elevated temperatures. They also are both non-hardenable by heat treatment and can be readily formed and drawn. Annealing 316 and 316L stainless steels requires heating to between 1,900 and 2,100 degrees Fahrenheit (1,038 to 1,149 degrees Celsius) before rapidly quenching. 316 stainless steel has more carbon in it than 316L. This is easy to remember, as the L stands for "low." But even though it has less carbon, 316L is very similar to 316 in almost every way. Cost is very similar, and both are durable, corrosion-resistant, and a good choice for high-stress situations. 316L, however, is a better choice for a project that requires a lot of welding because 316 is more liable than 316L to weld decay, though 316 can be annealed to resist weld decay. 316L also is a great stainless steel for high-temperature, high-corrosion uses, which is why it's so popular for use in construction and marine projects. Neither 316 nor 316L is the cheapest options. 304 and 304L are similar but lower-priced. And neither are as durable as 317 and 317L, which have higher molybdenum content and are better for overall corrosion resistance. Type 316 steel is an austenitic chromium-nickel stainless steel that contains between two and three percent molybdenum. The molybdenum content increases corrosion-resistance, improves resistance to pitting in chloride ion solutions, and increases strength at high temperatures. Type 316 grade stainless steel is particularly effective in acidic environments. This grade of steel is effective in protecting against corrosion caused by sulfuric, hydrochloric, acetic, formic, and tartaric acids, as well as acid sulfates and alkaline chlorides. Common uses for type 316 stainless steel include in the construction of exhaust manifolds, furnace parts, heat exchangers, jet engine parts, pharmaceutical and photographic equipment, valve and pump parts, chemical processing equipment, tanks, and evaporators. It also is used in pulp, paper, and textile processing equipment and any parts exposed to marine environments. Type 316L stainless steel is an extra-low carbon version of the 316 steel alloy. The lower carbon content in 316L minimizes deleterious carbide precipitation as a result of welding. Consequently, 316L is used when welding is required in order to ensure maximum corrosion resistance.